This is the next generation robot which has all the functions necessary for selective soldering built into the machine. The L-CAT NEO-N has been designed for either an in-line or lean manufacturing process. A data management is available for PC communication, smart phone (IPhone, IPAD, Android) and mobile equipment. We have over 40 years of results and experience as a soldering robot manufacturer. Our application knowledge and customer requirements have made us stronger than our competitors. X, Y, Z and ZR axes are the all including X axis, are available the easy designing fixture and conveyer layout. Heavy work and long length work are no problem for the L-CAT NEO-N because there is no need to move the fixture. Moreover, this is available to the in-line and cell production. Normally soldering robots are fixed sequence. 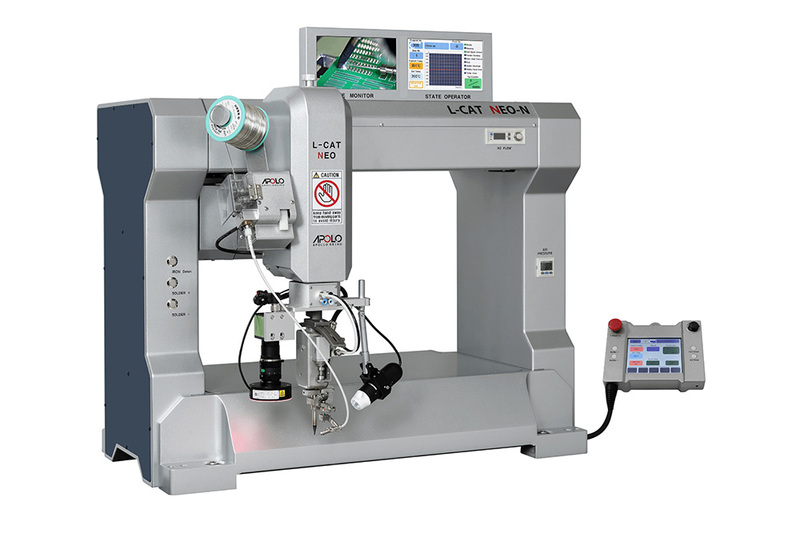 However, L-CAT NEO-N has a highly flexible soldering sequence that can be customized to meet the needs of your specific application. The L-CAT NEO-N offers flexibility for customization of parameters for applications which require high thermal energy as well as fine pitch devices. The robot management to the computer is now taken as a matter of course, you’re smart phone can communicate to the robot. The performance is becoming the name of next generation robot.